Fourteen weeks ago, we began the semester wide-eyed and nervous. As a group of five Harvard students in a field class about technology and innovation, we were thrilled to work with the Boston Police Department (BPD) Gang Unit. However, since our team had very little experience in criminal justice or gang violence, we wondered what we would be able to contribute. We didn’t have much time to worry as we were soon knee-deep in the action. We made multiple trips to the Gang Unit headquarters in Dorchester, interviewing detectives and patrolmen to better understand their challenges and day-to-day tasks. We went to the BRIC Data Center (where the police share intelligence) and visited with senior advisers in the Mayor’s Office to understand how the city was thinking about crime and violence prevention. Most importantly, we spent over nine hours in ride-alongs with officers through the Boston neighborhoods with the heaviest gang presence. These experiences gave us a view of the many challenges facing the Gang Unit. For example, we saw how difficult it was for the officers to remember, save, locate, and sort through the invaluable intelligence reports they received daily. We also observed officers frustrated with the multiple databases they access during a shift. Finally, we learned that there is a disconnect with what was happens at the policy level at the Mayor’s Office and the tactical on-the-ground work, and that police officers are not always fully informed of community programs and their participants. Our recommendations fall into two categories: enforcement and prevention. Our enforcement recommendations center on intelligence gathering and the data systems used in this process. Across all technology systems we recommend that BPD consider establishing an online directory of available tools and help guides for common tasks, to help officers navigate the numerous tools they have at their disposal, not all of which are intuitive, or even well known. Often, we observed the same task being completed in radically different ways by two officers, simply because the more efficient way to navigate the IT systems was not broadly known. In addition, we think it’s important to require user testing and a commitment to iterate in all technology (starting at the procurement stage). Too often in the past, IT systems were adopted because they met compliance needs (e.g. using FBI crime reporting codes) even if they didn’t meet officer needs. In fact, we heard horror stories about essential IT systems that were so hard to use, officers simply stopped using them as often. We hope that user testing will reduce the need for help guides and other crutches by making sure that police IT systems work for officers from the get-go. In addition to these recommendations about IT systems, we also developed a specific prototype for one common task: searching for past intelligence reports. Our prototype, based on hours of tests with gang unit officers, is available online here. Should the BPD decide to further develop it, we recommend that they prioritize a mobile application, and consider building the BRIC intelligence reports for searchability perhaps in a database style format, rather than the current PDF format. · Develop a clear point of view about how Operation Exit should factor into the outcome of discretionary stops. Our work over the past semester has given us an even greater appreciation for all that policemen do to keep our communities safe, and it is our hope that our work will help make the job of Gang Unit officers easier and safer. We are grateful to the Boston Police Department for partnering with us on this project and being patient, even as we made many requests of their time and asked endless questions. Thank you! As we embark on new adventures, we are proud to say that we will take with us many learnings from the course. For those of us going into city government, the application will be seamless—questioning traditional assumptions about government services, focusing first and foremost on the user experience, and iterating and prototyping ideas before rolling out solutions. Regardless of our future career plans, we have all appreciated the diversity of our team, and what can be accomplished in an environment in which no idea is too crazy to explore. Back in the early 2000s, the Boston Youth Options Unlimited (Y.O.U. Boston) operated a youth recreation center in Roxbury, where they provided young people from high-poverty neighborhoods a place to hang out and get their homework done. At least, that’s what they thought they were doing. To the surprise of Y.O.U., the police officers informed them that the kids in the building were not only Y.O.U. regulars, but also gang members—in fact, they represented multiple gang networks throughout Boston. The police officers were afraid that violence might break out at the youth center; the Y.O.U. staff began to realize that the services they were providing were much more profound than basketball courts and quiet spaces for homework. To the gang-affiliated youth who were Y.O.U. regulars, Y.O.U. provided a very rare safe space where they could address many of the complex social challenges (from health to education to housing) that contributed to their gang affiliation in the first place. Often, having been kicked out of the YMCA and Boys & Girls clubs in their neighborhood, Y.O.U. was the only safe space these kids had left. Since then, Y.O.U. Boston has leveraged their trust and success in working with gang-affiliated youth to launch a variety of other programs. Perhaps the most prominent is Operation Exit, Boston Mayor Marty Walsh’s flagship program to provide gang-affiliated youth pathways out of violent conflict by equipping them with the skills for successful careers in union trades, hotels, and even computer coding. The program has been a success overall, graduating nearly 50 people in three cohorts and placing nearly all of them in jobs. Even beyond those 50 graduates, the City hopes that Operation Exit is changing a culture of low expectations and few opportunities that contribute to gang affiliation. As students in Professor Nick Sinai’s Technology and Innovation in Government course, we have been hearing all semester about the importance of Operation Exit to the City of Boston. We’ve also been charged to search for ways in which improving the flow of information can help the Boston Police Department. To us, this story about the founding of Operation Exit represents the best of what free-flowing information can do for the city: when the knowledge and experiences of officers and community workers came together, brand new opportunities for serving gang affiliates became apparent. It takes a village to solve a problem like gang violence—but when that village becomes too big, that can cause its own issues for sharing knowledge and ideas. Operation Exit Team at Turner Consulting. Image from Y.O.U. Boston. One challenge that Operation Exit faces today is that too often, productive information sharing is accidental, not systematic. Just as police officers a decade ago were surprised to learn which kids Y.O.U. was serving, Y.O.U. staff today are often surprised by who police officers are stopping on the streets. Too often, they fear, the youth participating in Operation Exit are stopped by the police. (Y.O.U. staff admitted that police stops of Operation Exit participants are often justified; but just as often, they fear the stops simply reflect how difficult it is to untangle oneself from old friends and neighborhoods, even while making major changes in the rest of one’s life.) After stopping an Operation Exit participant, police officers see only the participants long criminal record, and often have no idea that the person they stopped is trying to “do the right thing” and making progress to establish a better life. If the officers knew that their suspect was making legitimate progress toward a career, it may help to build trust and support the suspect’s tenuous attempts to establish a career. But without that key information, there is little reason to treat them as anything other than a criminal. Boston police officers are already working to reduce the higher rate at which young men of color are stopped and arrested; more knowledge of Operation Exit participants may be one piece of that puzzle. That’s where we think we can help. Our charge is to help information flow more freely to aid the Boston Police Department. We believe that the relationship between Operation Exit staff and police officers is one place where increasing information flow could make a big difference. Even better, the problem can likely be addressed via simple but effective solutions, such as emails, posters, meet-ups, ID cards, and Google Docs. These seemingly simple interventions could keep officers and Operation Exit staff aware of each other’s work. Instead of building or buying the latest technology, we think that in this instance BPD would be better served by using everyday collaboration tools to share information, as a regular part of everybody’s job. Operation Exit is not the only place where we believe that better processes can make a big difference in the lives of police officers and citizens. Our team is also prototyping tools to 1) make seizing illegal firearms safer by centralizing much of the city’s building data (a practice already being used by the Fire Department while responding to dispatches), and 2) help officers stay abreast of the many intelligence briefings they receive every day. This week, we spent our time brainstorming solutions, mocking up prototypes, and testing assumptions. As we move into the weekend, we are excited to begin testing our ideas with police officers and detectives — and then, of course, revising and re-starting the brainstorm and design process based on what we’ve learned! 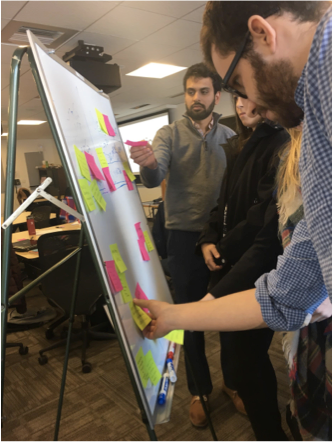 This week, our team worked to brainstorm and prototype a variety of solutions to several of the biggest challenges facing the BPD. “I think he might have a gun.” As the Boston police officer uttered those words, Berkeley Brown slid down deeper into her seat in the back of the police car. As a member of our student team working with the Boston Police Department’s Gang Unit, Berkeley was on a ride-along with some of the unit’s patrol officers. While our entire team was excited about the prospect of a front-row seat to the officers’ daily work, those few words served as a tangible reminder of the complex and dangerous situations that the officers face every day. Fortunately, the incident turned out to be a false alarm and all of the ride-alongs went on without a hitch. These ride-alongs represented our first exposure to the gang unit’s patrol officers, who make up a majority of the unit’s personnel. Unlike the detectives who write search warrants and process evidence, the patrol officers are the front-line of the unit, monitoring and responding to gang activity on the streets. As officers navigate the fluid and complex nature of gang activity in Boston, they also have to navigate a variety of software systems and sources of information that can be particularly cumbersome during critical moments. These technological constraints echoed some of the similar themes we saw when learning about the warrant process, where access to reliable information can be the difference between life and death. The gang unit’s charge is to reduce gang activity and gang affiliation. Tactics vary based on their objective, and is the team’s interpretation of what occurs. For that reason, it may not be perfectly accurate. Each insight represents a unique area for our team to work on developing solutions for the gang unit. In order to figure out which areas and potential solutions to focus on, we plan to use the K-J method to focus on those where we can add value and have a meaningful impact. We’re excited to develop something that could make incidents like the one witnessed by Berkeley at least a little bit safer for the officers and detectives of the gang unit. There are a lot of questions you can ask about an address: Who lives at the address? Who doesn't live there, but is a frequent visitor? Are there children in the house? How many rooms are there? Is there more than one level? Is the door even marked? The questions are endless, but the answers are sparse and scattered. Now, imagine you’re trying to answer all of these questions, and you can’t be wrong. That’s just one of the challenges that the Boston Police Department Gang Unit faces when ensuring a search warrant is successfully executed. Because of these challenges, detectives in the Boston Police Department Gang Unit spend much of their time gathering information. Often this involves consulting past search warrants or talking with confidential informants who have visited the sites under investigation. A key source of information to Sgt. Broderick and other detectives in the Boston Regional Intelligence Center (BRIC). In the words of Ryan Walsh, Deputy Director of the BRIC, much of their work can be described as “journalism for law enforcement.” Each day starts with a 9:30am information-sharing conference call between every department and district in the area. By 4pm, the BRIC consolidates information about recent gang activity and officer safety alerts into a report which is disseminated via email to all police officers citywide. In addition, gang unit detectives often request information from the BRIC. This might include structured information like photos of a suspect or names of people with whom a suspect has been arrested. But often detectives need more unstructured information, such as relationships between gang members, or what hats members of certain gangs wear to identify themselves. This unstructured information is difficult to systematize, and detectives often rely on individuals at the BRIC to relay this information when they need it, e.g. when they want to understand the relationship between gang associates. Across both the gang unit and the BRIC, a common challenge is hardware and budget. BRIC analysts voiced a desire for an internal knowledge management system, but acknowledged that upgrading their technology to allow it would be costly. Similarly, Sgt. Broderick wondered whether some issues would be solved if the unit was equipped with more iPads. While hardware and budget issues are beyond the scope of this course, they are incredibly helpful constraints for us to consider as we narrow in on a problem we can solve. This week, our objective is to learn about how that data is used by detectives and patrolmen on a daily basis, both on and off the streets. Through ride-alongs and interviews with detectives, we hope to hone in on a tool that will make the gang unit detectives’ jobs easier, more efficient, and, ultimately safer for everyone involved. Last Friday, our paths crossed with Gerard and Daniel in Harvard Kennedy School Professor Nick Sinai’s Technology and Innovation in Government course. Our team is one of five in the class matched with clients at all levels of government and tasked with helping them solve a problem. Gerard and Daniel lead the Boston Police Department Gang Unit, our team’s client. At our first sit-down with them, we learned that there are about 150 documented gangs and 3,500 young people involved in gangs in Boston. Around 750 firearms were removed from communities last year – 150 by the gang unit. Clockwise from far left: Daniel Mulhern of the Mayor’s Office, Francesca Ioffreda, Daniel Goldberg, Ihsaan Patel, Namita Mody, and Berkeley Brown. The gang unit’s goal is “to reduce the criminal activity and anti-social behavior of youthful offenders and youth gangs through directed and community-based policing strategies.” The unit, also known as the Youth Violence Strike Force, must balance multiple goals, including developing an understanding of and respect from the community while simultaneously protecting the safety of the officers and the public. Currently, our team’s objective is to increase the speed of information gathering in the unit, but until we start speaking with the detectives, we won’t know for sure. What we do know is that our solution must take into account the utmost safety, security and efficiency for not only the detectives with whom we will be working, but the City of Boston as a whole. And while the class’s title includes “technology,” our solution may not be entirely technology-based. In fact, it might not be very technical at all. What’s most important is that our work is guided by the tech world’s best practices: intense focus on the product’s user, as well as rapid testing of our hypotheses regarding the user’s experience. In this case, the “users” are the police officers for whom we design our solutions. Berkeley Brown (College ‘18) is a Social Studies concentrator at the College who serves in leadership roles within Harvard’s student government, Peer Advising Fellows program, and Harvard Alumni Association. She previously worked as an associate at TurboVote, a non-profit dedicated to increasing voter turnout. She is excited to work with and build solutions for the BPD this semester. Daniel Goldberg (MPP/MBA ‘19) previously worked as a management consultant to public school districts across the US, where he helped superintendents improve student outcomes while also effectively managing resources and operations. He’s excited to learn from the Boston PD. Francesca Ioffreda (MPP/MBA ‘17) previously worked as a management consultant across multiple industries and countries. She is passionate about city government and has worked with Mayor Rahm Emanuel in Chicago and Mayor Landrieu in New Orleans. She is excited to work with the Boston PD and support this important project. Namita (Nami) Mody (MPP ‘18) was previously a product manager and project manager at DoSomething.org, where she improved the efficiency of internal systems and led the organization’s data organization and accessibility efforts. She has an affinity for internal users and processes, and is looking forward to learning how the Boston PD works behind the scenes. Ihsaan Patel (MPP ‘18) previously worked as a senior finance manager for Greenlight Planet, a social enterprise selling solar lamps to unelectrified communities across the developing world. He is excited to help build something useful for the Boston PD. The five members of our team are incredibly keen to spend the next eleven weeks speaking with detectives from the BPD Gang Unit and learning about the ins and outs their investigation practices so that we can identify a discrete problem and work towards a solution. And thanks in advance to the Boston Police for your time and help on this project. We can’t wait to work closely with you!